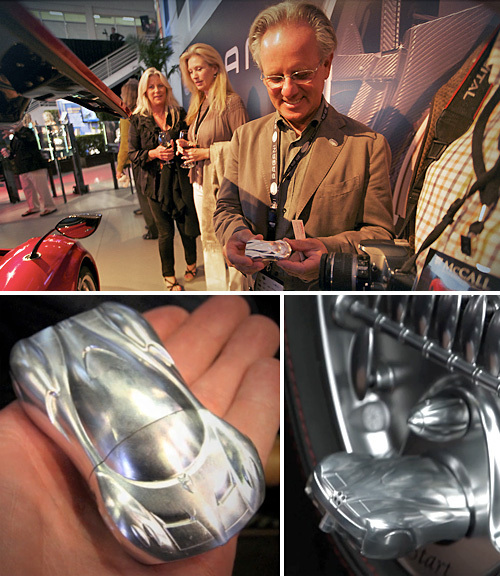 The Pagani Huayra's Ignition Key Is Actually A Miniature Aluminum Version Of The Pagani Huayra | OhGizmo! Leather Vinyl Wrapped Ferrari F430… Why?! Why?! Why?! The Pagani Huayra has been often mocked on Top Gear for being nearly impossible to pronounce, but I’m sure they’ll have a few nice things to say once they get behind the wheel. What it’s lacking in pronounceability, I’m sure it more than makes up for with performance — and having a really cool key! eGarage had a chance to see it in action, demo’d by Horacio Pagani himself, and it’s actually a miniature version of the supercar that splits apart. One side is the key itself which is inserted into the dashboard to start the car, while the other side is a USB flash drive that can be used to hold music, and presumably interface with the Huayra’s stereo, assuming it actually has one. And even though aluminum is often used because it’s relatively light, it looks like this key still has a bit of heft to it given its size. That key is not cool. It’s ugly. It’s big. It won’t fit, comfortably, in a pants pocket. I’ll need a murse just to carry the bloody thing around. It’s bigger than a normal and and USB stick combined. And of course, the USB stick capacity, if not already obsolete, will be obsolete shortly.